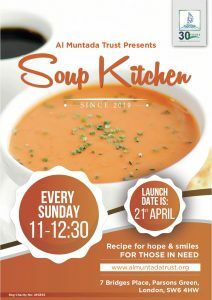 Al Muntada Trust is proud to present its Soup Kitchen launching Sunday 21st April 2019. It will run once a week every Sunday 11am - 12:30pm. The aim of the Soup Kitchen is to provide a free meal and support to those vulnerable and in need in our community. We will also be offering pastoral support especially as at times, people need personal advice, wisdom and prayers. For more information on the soup kitchen and sponsorship opportunities please contact us on info@almuntadatrust.org or call 020 7471 8260.